Need help in Brisbane to wall mount the TV? Jim’s Antenna’s can help. Call 131 546 now (7 days from 8am-8pm); or just Book a Time Online for a Free Quote. Call outs are free, and there is no obligation. Which is why we highly recommend that you call in the local Brisbane TV Wall Mounting Professionals at Jim’s Antennas, who can not only expertly fit the TV to the Wall, they can supply the correct TV Wall Bracket, ensure all cables are hidden, and Set Up and Tune your new Digital TV if you need. And did I mention our team are fully insured? Don’t risk injury or that prized new TV – get the professional TV installation service from Jim’s Brisbane that comes with a 100% Satisfaction Guarantee; and an excellent Product Warranty. 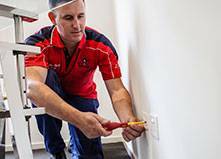 There are 5 franchisees servicing the suburb of Brisbane. There was no more to be done and all is working well. Warren was amazing. Punctual, friendly and efficient. I would definitely use him again and would have no problems recommending him to friends. Problems With New WIN Digital Channels?